It occurred to me at the 11th hour last year that, in addition to an awesome snack of some sort (which this year, I’m still deciding between the Snowmen or Reindeer! EEP! ), I needed a gift for my son’s school party. It was the 11th hour here. The last minute. I had no idea what to do. 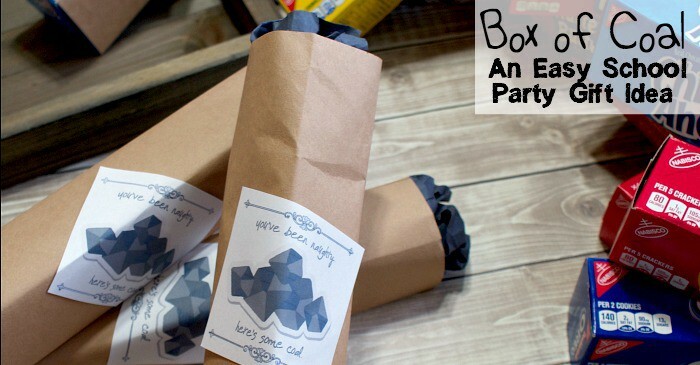 But the Easy Kid’s School Party Gift Idea I had, yeah, the Box of Coal…my son loved it so much, he asked me to make it again this year for his party. 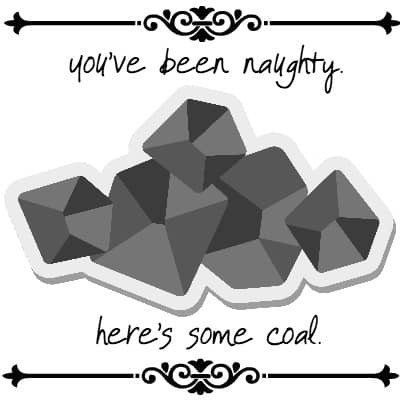 Funny and cute, the kids really seemed to get a kick out of opening their box of coal, only to find cookies inside. LOL! 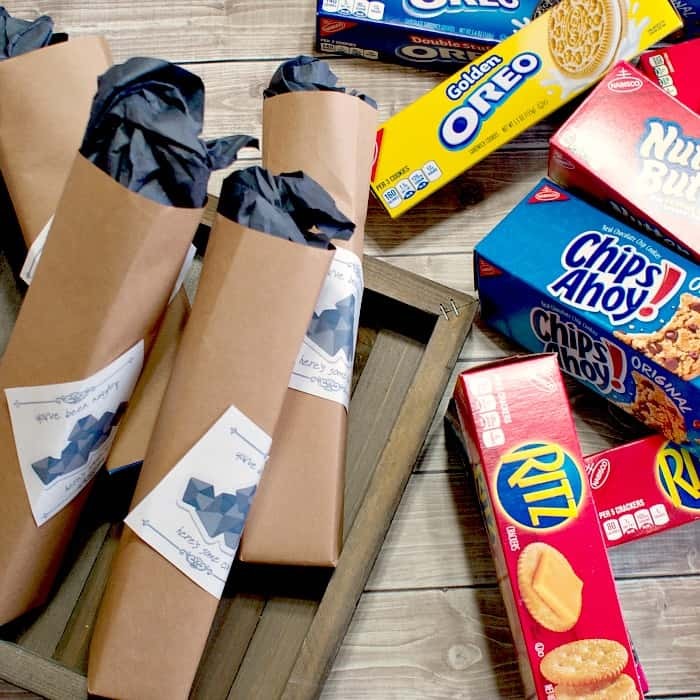 A small, single-sleeve box (or 94) of the OREO Cookies, OREO Double Stuf, RITZ, ChipsAhoy!, or Vanilla OREO Cookies – you know, the snack size boxes that fit in a stocking…because that’s what we’re going for here. They’re inexpensive (so you can afford to buy one for each kid in the class), easy to find (right near the checkout in one of those big bins at Walmart), and they’re awesome…and the joke is pretty awesome, too. You can download the JPEG here or the PDF here. Heh. 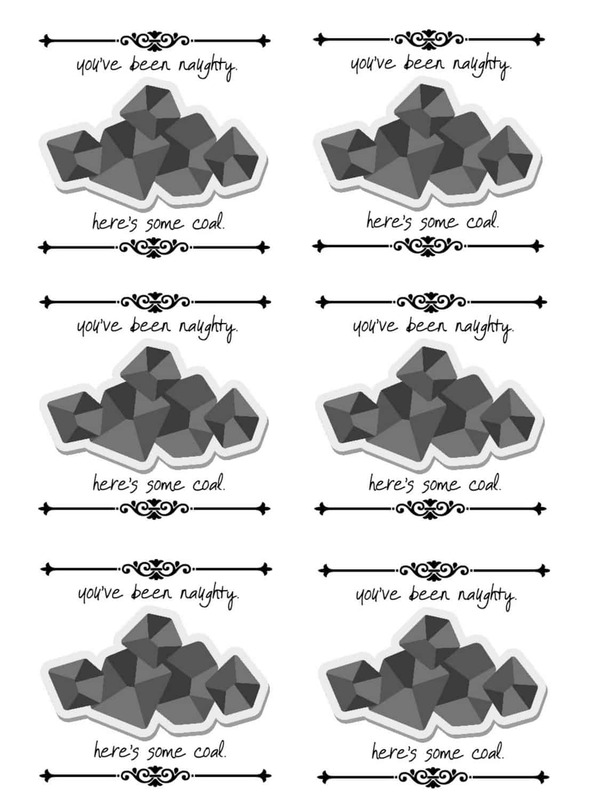 Look how cute that makes it…the “just right” finishing touch for a box of coal. As if a box of coal needed a “finishing touch”. LOL! 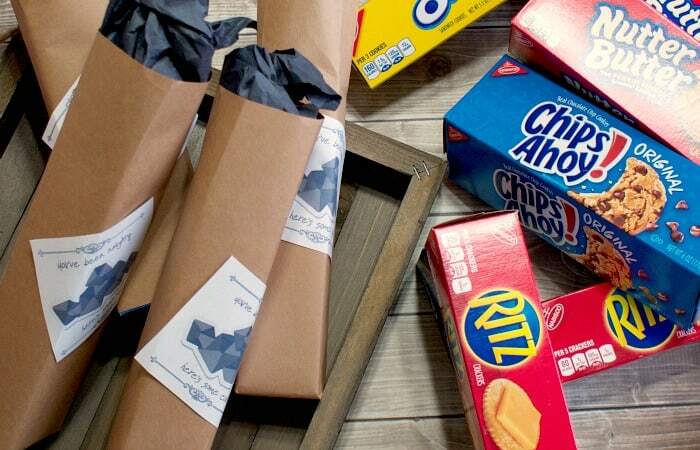 Ok, this is such a simple how-to, I’m just going to roll with photos here, but its basically: Wrap the cookies in the brown paper, leaving one end open, stuff the crumpled black paper into the top and pop the gift tag on top. Easy, neh? 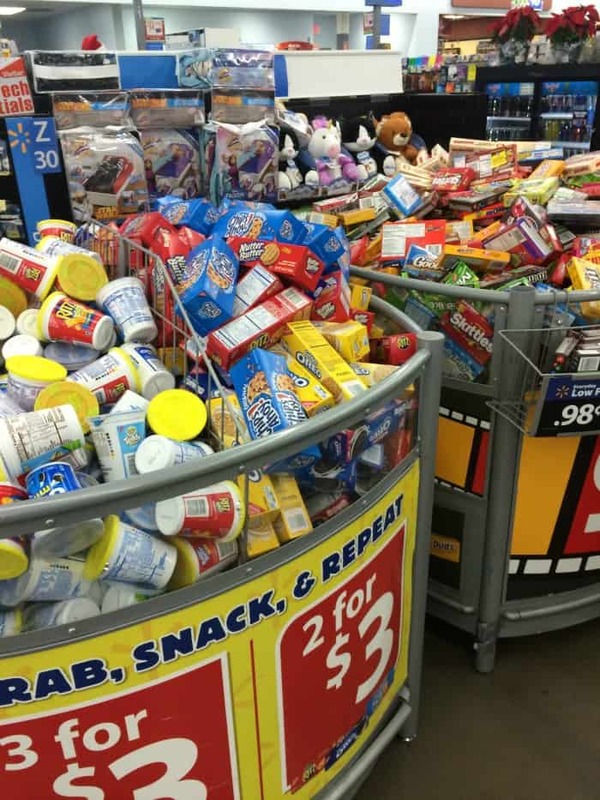 And then you’re done–and those kids are happy! If you loved this, you love the other creative ideas for Stocking stuffers here. 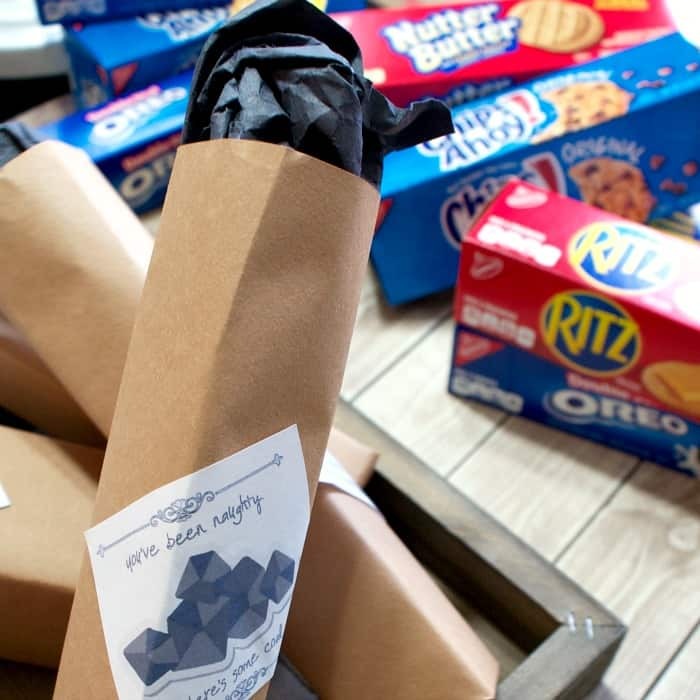 When you make your fun boxes of coal, be sure to drop me a note in the comments–I’d love to hear if you have any other ideas for making the kids laugh as they get their annual holiday-party-sugar-plosion. LOL!